Every year, the United States celebrates President’s Day on the third Monday in February. President’s Day was created to honor the birthday of the nation’s first president, George Washington. Abraham Lincoln’s birthday is also celebrated in February, and because of his historical impact on this country, many consider President’s Day a combination of the two presidents. 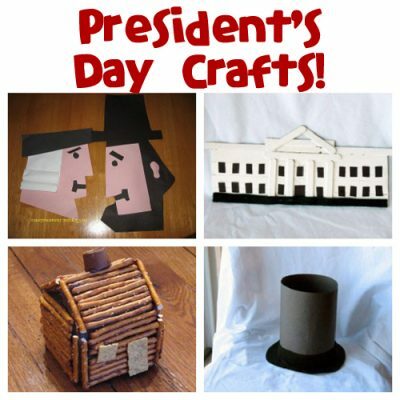 To celebrate, we have some fun President’s Day crafts for you to enjoy with the kids! Here are ten of our favorite President’s Day projects. You can see all 40+ here. 1. Mini President Figurines – Decorate small wooden figures to look like some of our most beloved presidents. Look at photos or portraits as you craft for clues about clothing and hairstyles. 2. Regal Eagle Cookies – These delicious, no-bake cookies are inspired by our national bird. They’re easy to make and a fitting tribute to our presidents. 3. President’s Day Photo Booth Props – Make simple photo booth props for some extra fun on President’s Day. Dress up with George Washington’s wig or Abraham Lincoln’s top hat. 4. Patriotic Silhouettes – Celebrate President’s Day by making silhouettes of some possible future presidents! This fun craft makes a neat keepsake. 5. Craft Stick Bald Eagle – Turn craft sticks and construction paper into a majestic bald eagle. It’s a great project for President’s Day. 6. Presidents Lincoln and Washington Crafts – Use paper plates to make the cutest President’s Day craft ever! This fun project is easy to do and pairs wonderfully with children’s dictation or writing. 7. Footprint American Flag – Turn your footprint into an American flag. This patriotic craft is a great choice for President’s Day. 8. Graham Cracker Flag Dessert – This tasty dessert is perfect for any patriotic holiday. It’s simple to make and pulls apart for easy serving. 9. Lincoln’s Log Cabin -This log cabin craft provides excellent practice with cutting skills. It’s a fun way to introduce President’s Day to young children. 10. President’s Day Marshmallow Pops – These yummy marshmallow pops look like cherries and a top hat. They are a really fun treat to enjoy on President’s Day. 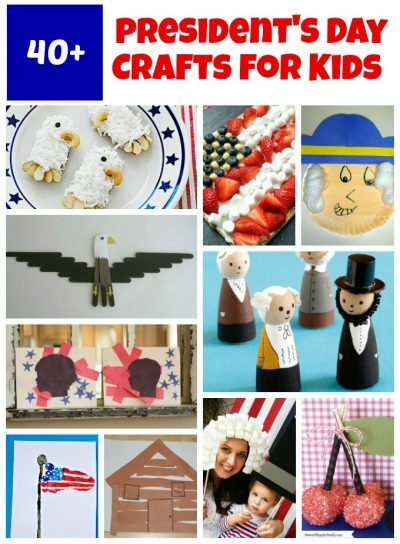 You can see all the President’s Day crafts and recipes here.